THE THRIFT SAVINGS PLAN ALLOCATION GUIDE › Forums › Message Board › This Summer? › Reply To: This Summer? Thanks very much for posting, and I promise I am not going to monopolize the message board and race to be the first to respond to everything. For this summer? I don’t know what the next month or two will hold (and I certainly expect some blips), but I do feel fairly confident that the S Fund (and C Fund) will end the year higher than it is now, and that’s more the time period I feel comfortable looking at. And if I could short the F Fund, I would do it, because I am very confident it will be lower. As far as that particular article, I am not a big fan of technical analysis. My investing life has been spent in pursuit of a system which is simple and works to predict movements in the stock market, so TA has a lot of appeal. I did a lot of reading and experimentation and was never able to satisfy myself that there was a way to successfully apply it. That is when I moved on to how the bigger economic picture and indicators from outside of the market impacts the stock (and bond) markets for making my decisions. 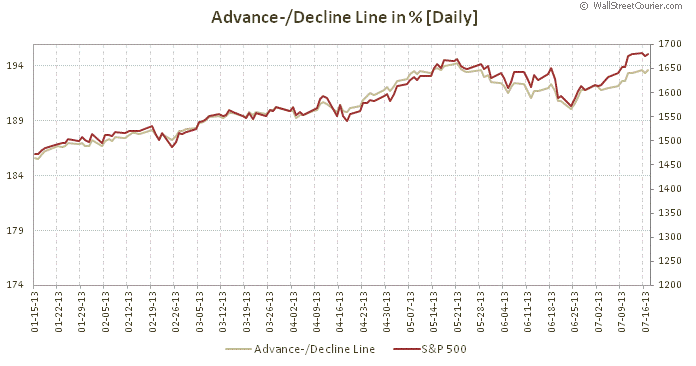 It may well be a rough summer for stocks, but I don’t know if the advance-decline line is a bell weather. When I look at the chart below, I see that there was a significant deviation in June and the market fell, but then immediately started back up and went on to new highs. The deviation is less pronounced now, so does that mean a smaller fall and then more highs again? Or does that just mean that the A-D line will come back up to meet the S&P as it sometimes does? That’s just one guy’s opinion. What does everyone else think the summer holds?